It seems that Israel is never out of the news for long. 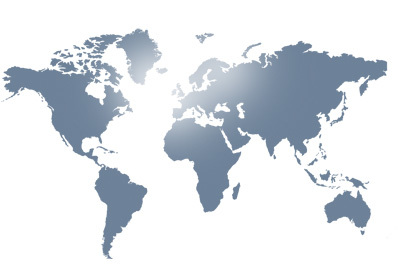 Despite its small size and insignificance compared to the G8 nations, the spotlight of the world's attention falls frequently on this troubled country. A (generally) pro-western state surrounded by (generally) anti-western neighbours. A (nominally) Judaistic nation surrounded by (nominally) Islamic Nations. The powerful Jewish lobby in the United States and elsewhere, mustering support. A capital city (Jerusalem), holy to three different (and often conflicting) religions; Judaism, Islam and Christianity. Isaiah 43:10 “You are my witnesses,” says Yahweh, “With my servant whom I have chosen; that you may know and believe me, and understand that I am he. Before me there was no God formed, neither will there be after me. The Bible says that Israel are God's witnesses. Through them, we can see God at work, bringing about His plan and purpose for the Earth. When Britain pulled out of Israel in 1948, no-one gave them a chance against the combined armies of the Arab nations around them and yet they managed to survive and grow. In the Six Day War, Israel again pulled off a decisive visual against overwhelming odds. These are signs that God is with Israel - not because they deserve His support, but because Yahweh has chosen them as His witness and because of the promises made to Abraham, Isaac, Joseph and David. These and many other verses detail the promises that God made to his faithful followers concerning the land of Canaan. It is because God keeps His promises that Israel inhabit the land, not because they are in any way deserving. When the Israelites first entered the land that God had promised them, they were commanded to drive out all the nations that had moved into Canaan during Israel's four-hundred year stay in Egypt. This was a "shadow" or parallel with the life of a Christian. The principle was separation from the world and all its evil influences. But Israel disobeyed God and allowed pagan peoples to remain within the borders of Israel and slowly but surely, these pagan, worldly influences corrupted the Israelites, bringing upon them God's displeasure. God's anger was so great that He brought other nations against Israel, such as Babylon, Assyria, Greece and Egypt, in order to punish Israel for their disobedience. Eventually, following Israel's rejection of Jesus as their Messiah, God's anger brought Rome to completely flatten the land and take the people into captivity, once again. 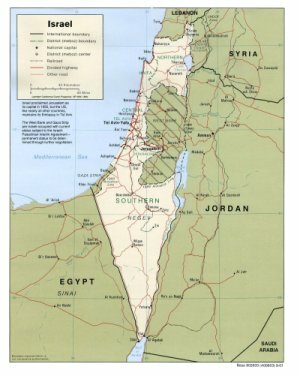 This time, the dispersion or diaspora, lasted about 1,900 years, during which time, the mixed Arab race known as the Palestinians became established in the land, under a succession of "masters", including Moors, Crusaders and Turks, to name a few. But because of His promises, God, following the Second World War and the persecution of the Jews, brought about their return to the land. As we have mentioned, this was just the start of their battle for survival against their largely hostile neighbours (one could also say relatives, as the Arabs are also descended from Abraham). Is the Current Conflict part of God's Plan? It is the purpose of Bible prophecy to give encouragement and direction to those who diligently seek God. With the benefit of hindsight, it is much easier to see to see God's guiding hand at work. Isaiah 43:5 Fear not: for I am with thee: I will bring thy seed from the east, and gather thee from the west; Isaiah 54:7 For a small moment have I forsaken thee; but with great mercies will I gather thee. Jeremiah 23:3 And I will gather the remnant of my flock out of all countries whither I have driven them, and will bring them again to their folds; and they shall be fruitful and increase. Ezekiel 11:17 Therefore say, Thus saith the Lord GOD; I will even gather you from the people, and assemble you out of the countries where ye have been scattered, and I will give you the land of Israel. These and many other scripture talk about the restoration of Israel and against all odds, in 1948 these prophecies came true - but this is only part of the story. Jeremiah 3:17 At that time they shall call Jerusalem the throne of the Lord; and all the nations shall be gathered unto it, to the name of the Lord, to Jerusalem: neither shall they walk any more after the imagination of their evil heart. Psalm 102: 18 This will be written for the generation to come. A people which will be created will praise Yah. 19 For he has looked down from the height of his sanctuary. From heaven, Yahweh saw the earth; 20 to hear the groans of the prisoner; to free those who are condemned to death; 21 that men may declare the name of Yahweh in Zion, and his praise in Jerusalem; 22 when the peoples are gathered together, the kingdoms, to serve Yahweh. These scriptures - and again, we could pick many more - talk about Israel being restored, but also a greater gathering of the Nations. We read also of the establishment of God's throne in Jerusalem. This situation is tied in with the return of Jesus Christ to the Earth. Connected to this event are many prophecies concerning an event that everyone has heard of - Armageddon. This may mean different things to different people, but the biblical reference is to a specific battle in the valley of Megiddo in Israel, when the "King of the North" will sweep down and attack a peaceful Israel. Israel will be successfully defended by the Lord Jesus and all those in opposition to him will be destroyed (for more details, please read the whole of Ezekiel chapter 38). Ezekiel 28:14 Therefore, son of man, prophesy and say unto Gog, Thus saith the Lord GOD; In that day when my people of Israel dwelleth safely, shalt thou not know it? 15 And thou shalt come from thy place out of the north parts, thou, and many people with thee, all of them riding upon horses, a great company, and a mighty army: 16 And thou shalt come up against my people of Israel, as a cloud to cover the land; it shall be in the latter days, and I will bring thee against my land, that the heathen may know me, when I shall be sanctified in thee, O Gog, before their eyes. 17 Thus saith the Lord GOD; Art thou he of whom I have spoken in old time by  my servants the prophets of Israel, which prophesied in those days many years that I would bring thee against them? It is quite common, every time Israel is attacked, that Bible scholars look to the prophecies of Ezekiel chapter 38, hoping and praying that the attacks are a fulfilment of the prophecy and Armageddon and the return of Christ to set up his Kingdom on Earth will soon come to pass. The prophecy in Ezekiel talks about a peaceful Israel being attacked. 1 Thessalonians 5:2 For you yourselves know well that the day of the Lord comes like a thief in the night. Mark 13:32 But of that day or that hour no one knows, not even the angels in heaven, nor the Son, but only the Father. The first point suggests that much as we would like it to be, the conditions do not match those Bible references to Christ's return; Israel is not currently dwelling peacefully in unwalled towns. The second point reminds us that no matter how closely and carefully we watch, the return of Christ to Earth will catch us by surprise. The third point should warn us not to believe those who say that Jesus has already returned or that he will come back on such and such a day or in a certain year; we simply cannot know. It is well worth reading also, Matthew chapter 24 which deals with what are known as the "Signs of the Times", or follow the link to a further article. 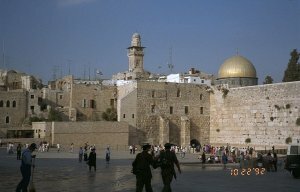 We cannot tell for certain whether the current events in Israel will specifically lead to the return of Jesus and the setting up of the Kingdom of God or whether they are part of the general "wars and rumours of wars", which is one of the Signs in the World that Christ's return is not far off. Rather than speculate too much, we should rather concentrate on living each day as if it was our last and making sure that we are in a constant state of readiness for the return of Jesus - whenever it may be. Matthew 24: 33 Even so you also, when you see all these things, know that it is near, even at the doors. 34 Most certainly I tell you, this generation will not pass away, until all these things are accomplished. 35 Heaven and earth will pass away, but my words will not pass away. 36 But no one knows of that day and hour, not even the angels of heaven, but my Father only. 42 Watch therefore, for you don’t know in what hour your Lord comes. Copyright © 2000 ---. All Rights Reserved.